"Brands need to stay close to their DNA"
In the first interview in our new CEO Series, we had a chat with Grayling Amsterdam's Managing Director Niels Broekhof. 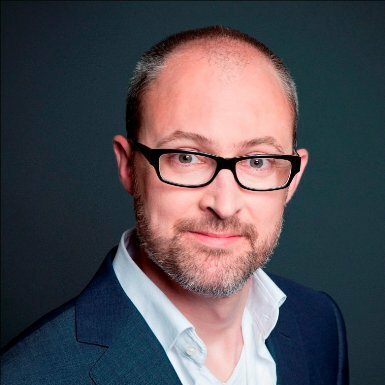 Niels shares with us why he is so passionate about PR, his views on the complexities of managing a brand in today's world and what the phenomenon of fake news means for PR. Check back regularly as more interviews with other leading figures within the Benelux PR, Marketing and Advertising industry will be published here. 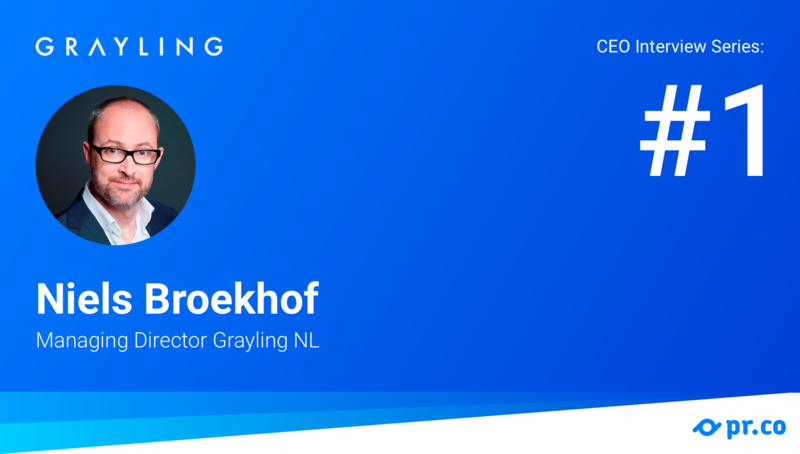 My name is Niels Broekhof and I am the Managing Director of Grayling and responsible for our Amsterdam office. Although the Amsterdam office is part of a bigger global network serving international clients such as British Airways and Hilton, we’re also a boutique agency at the same time. We see ourselves as a Benelux agency as clients increasingly look at the region as one market and it is simply easier to hire an agency with reps in Amsterdam and in Brussels. The services we provide and consequently our job has changed a lot over the last years. Clients are really interested in a full-service approach and our offering therefore touches on advertising, Influencer Marketing as well as includes more traditional media relations as part of public relations. Although we don’t compete with the big advertising agencies, we also run advertising campaigns for Nikon as an example. For me it is really about passion. I just love the dynamics between media - digital or else - and the image and brand of companies and how this relationship changes. I also just respect how journalist work. Originally, I wanted to study journalism at the University of Utrecht but then decided to switch to PR studies as I thought it would be a better fit. To this day I still have many journalist and PR contacts from my time at university. The Dutch market is in many ways very advanced and over 90% of Dutch consumers use their mobile phones as a main source of information. We also have a very strong tradition in publishing and still have many print titles. The density of such titles per capita is very high if you compare it our neighbouring countries. What differentiates the Dutch PR market from other markets? The local PR industry is very fragmented with all major networks represented in the country; there are one-man bands next to many three to four people sized agencies and most are very good at a specific industry. Our Belgian Grayling colleagues are very strong in public affairs. Another difference is that our Dutch clients are very progressive and that's noticeable right from the briefing stage. We rarely exclude any channels and although many agencies say they work with a 360-degree approach, we actually include all of them in all of our client proposals. What role do bloggers & vloggers play for current PR strategies? They are very important. Here in the Netherlands we have a huge blogosphere and many vloggers. The plans we develop for most brands include bloggers and vloggers and we always propose a list of influencers to clients. However, it is critical to us to only propose influencers with a certain fit. Simply looking at number can be a mistake though as influencers with a huge following might just not be the right ones to work with. Working on such projects for Nikon and Puma we quickly understood that there needs to be a natural fit. If a blogger simply moves on to work with a competitor after a project, followers might realise that there is no real love and admiration for a specific brand and all work and investment might be lost. We require true love between a brand and a blogger. Does Grayling work with micro-influencers? Yes, we also team up with influencers with a smaller following but only after an assessment. These influencers need to be loyal and focused on a specific topic. 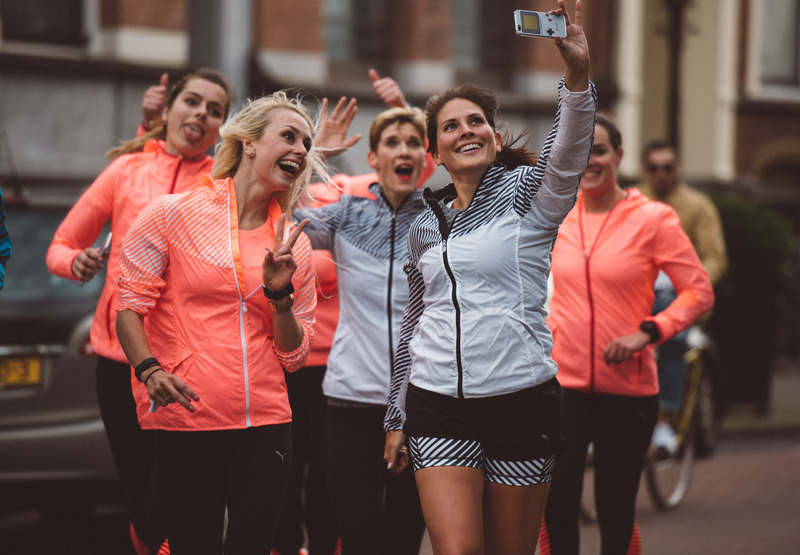 For example we worked with Puma on a running culture and outdoor activities project and we looked for micro-influencers focused on running & exercising techniques. Working with micro-influencers requires us to read the blog carefully to understand what the blog is all about. We also look at interactions, posting frequency, popularity metrics and other factors. What role does mobile, video and social play for today’s PR pros / practitioners? Here in the Dutch market we currently see the making of a new type of news consumer and here video is extremely important. Youtube is my kids’ preferred source of any information really and they’re getting most of their news from that channel. I am 43 now and I grew up with print newspapers and at weekends I spend quite some time with what I would consider a quality newspaper, the Volkskrant. My personal experience was later enriched by video, rich media and then mobile. But, it takes time to develop strong news and at the other end you want to be able to consume news fast and want to be informed about current affairs as and when they happen, a setup of streaming news if you will. And here our job as PR pros is getting more challenging since outlets are under pressure to deliver news faster and news, once published, also spread faster. At the same time we have to check the news to see if brands are properly covered. But, realistically, we only have very little time to correct inaccurate news. It is my job to read media and I like it as I am curious person. I spent quite a lot of time to read and scan various publications every day. I love to take some time with the Volkskrant and also read up on tech news as we have quite a few clients in technology. Here, I mainly read Tweakers, Mashable, TechCrunch but also the Guardian. I also follow some US news, read the Washington Post from time to time and I even sometimes watch Fox News to see what they are up to and how they frame news. It is important to me to keep my view of things as broad as possible and to fully understand a situation you need to read news from all different sides. As for my hobbies, I love flying and have a PPL license and read various aviation related media. I believe in the past it was much more difficult to demonstrate value. Today, clients would like to see traffic to specific websites or platforms and they can easily measure that. This includes additional metrics such as click-through and conversion rates. Many of our clients have their own metrics and consider only those. How do you demonstrate the value of your PR work to clients? Some clients have a different approach and would like to see their investment four times back. Grayling also works with a proprietary system, a mathematical calculation with many contributing factors, which can precisely calculate the impact a certain investment has generated. It is crucial to measure and work with the right data and you can take a lot of rich information from the traffic that comes to a specific website. Today’s smart technology allows to get insights into a website’s visitors’ behaviour and we include such info next to qualitative factors into our proprietary methodology for the total evaluation of a project. What kind of PR strategies and concepts work and which ones are likely to be ineffective? One thing I am wary of is to put the respective product or service right at the centre of the initial discussions with a client. What typically works is to spend more time during the initial stages of a project on the more challenging task of developing a great idea and to fully understand what specific groups are being targeted including members' behaviour and sensitivities - here, creativity makes the crucial difference. So, the work shouldn’t start with the product or service but with the end goal in mind, with what the client is ultimately trying to achieve. Fake news are a substantial challenge for the current political discourse - what does this mean for PR practitioners? Fake news certainly is a very big challenge for our industry and of course our society too. Fake news is a very broad term but if you define it as news written to be intentionally wrong, it is indeed a very worrying trend. But, you also have news which are not entirely accurate. So, often we act as brand guardians also and need to act really quick to get in there and make sure the right nuance is given. It is not our intention to tweak stories but to provide the respective journalist with all tools and info to produce a balanced story. Fake news intentionally produced by certain organisations to influence political processes is hard for us to fight. Particularly when it comes to preventing the distribution of such news. How do we for example prevent the amplification of fake news within social networks where a computer-generated algorithm drives this process? In my view technology companies should definitely be aware of their responsibility in this context which is the tension that currently exist between freedom of speech, censorship and social responsibility. Despite al of this I still have faith in journalism. What impact will Brexit have, if any, on the European PR industry? It is certainly something we follow very closely since we have our roots as an organisation in the UK. But, I find it hard to predict how it will impact our business. What do you think of PR technology providers such as pr.co? We have so many more communication channels to choose from and planning has become so much more complex. For some of our clients, for example Jaguar Land Rover, we work with an app on Facebook. This is so much richer than before and very exciting I think. To make all of this work you need effective tools to be able to respond properly and timely and to get the messaging and interactions just right. In the past we had to rely on journalists and today we have direct access to consumers which makes the job more complex and more interesting but of course also more risky. Do you have any PR nightmare stories you can share with us? I think I will struggle answering this question. Many of the things I stumble across I think could have been done better. But, the simple truth is that many of our clients have a strong story. And that is very powerful in itself and doesn’t require an additional layer. So, if we’re trying to get something across that differs from a client’s main story, it is simply a missed opportunity since today's consumers want realism. Generally, people see through a company’s shiny presentation layer easily - Glassdoor is just one example. Companies don’t get away anymore with putting up a shiny surface as it counts what and who you really are. However, PR people still tend to look for that shiny story. I am convinced both, media and end consumers, accept a slightly flawed image. People are not perfect and neither are brands and so the brands need to stay close to their DNA in order for the audience to understand what a brand stands for and accept its messages. Our job as PR pros is it to package this and highlight differences. I am convinced both, media and end consumers, accept a slightly flawed image. People are not perfect and neither are brands and so the brands need to stay close to their DNA in order for the audience to understand what a brand stands for and accept its messages. The pr.co team thanks Niels wholeheartedly for doing this interesting interview with us. You can connect with Niels on LinkedIn.